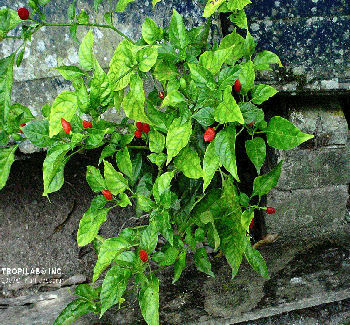 Cayenne pepper, red pepper, Chili pepper, lombok riewit, piment, pimento, lombok besar, cabe besar, lada besar. The flowers are white and the fruit is an avoid - to ellipsoid berry. This small fruit is red when mature and has a hot pungent taste; the smaller they are, the hotter. 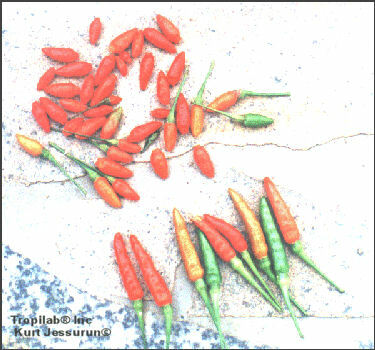 The dried ripened fruit pod is used to prepare the pepper. From the dried fruit and seeds a fiery spice is made and is used to flavor dishes from Asia, the Americas, and the Middle East. The seeds of Cayenne pepper are always hotter than the pod. 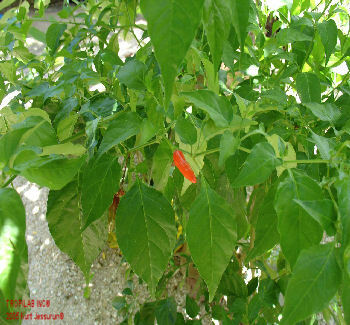 Cayenne pepper seeds are dispersed by birds. 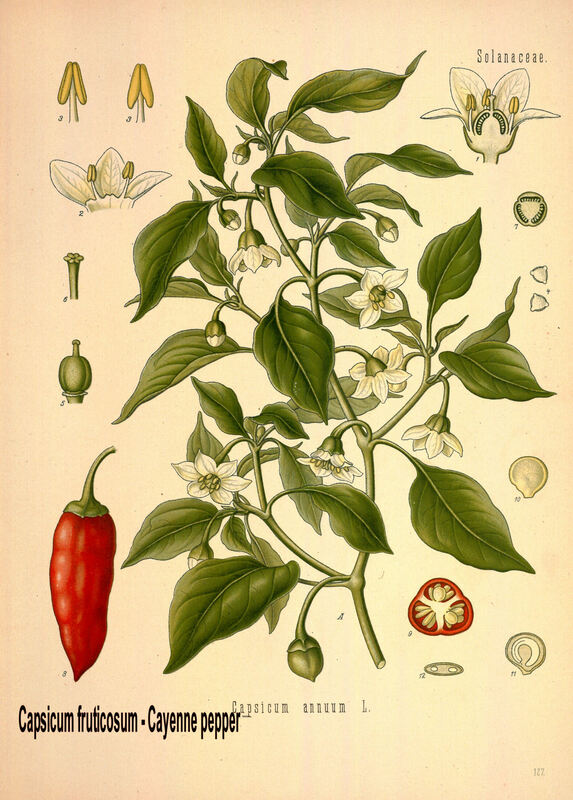 The seeds of Chili pepper contain capsaicin (a chemical compound); believed to have antibiotic properties. It lowers cholesterol and works against arthritis and rheumatism. 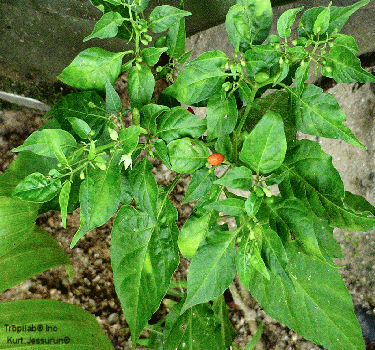 Capsaicin is present in large quantities in the seeds and the fruits. 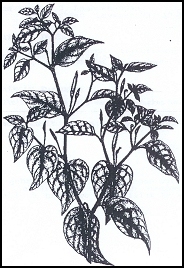 The seeds are dried, ground and used as a pepper; see Surinam cuisine. Cayenne pepper also has a high vitamin C content. Capsaicin relieves arthritic symptoms and improves joint flexibility. 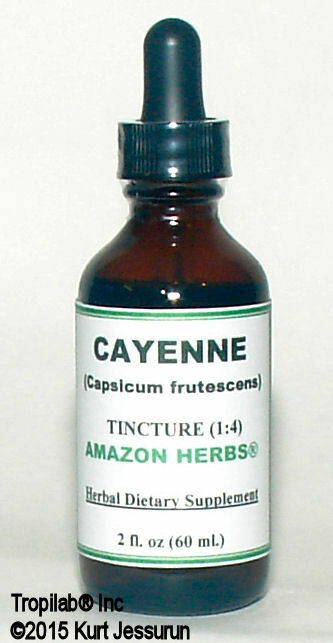 Cayenne pepper since there are a lot of therapeutic actions associated with it such as: aphrodisiac, diaphoretic, expectorant, neural stimulant, rubefacient, synergist vasomotor stimulant, topical vasodilator, etc. Visit our APPLICATION & DOSAGE -, CHOLESTEROL -, DIABETES - , HYPERTENSION - and TINCTURE pages. Full sun, moist well drained soil. It can be grown as an annual as high as USDA zone 7. Plant in the greenhouse or after the last expected frost.